Purported image of executed policemen following an attack in the Sinai Peninsula. Photograph from the Sinai News Network. 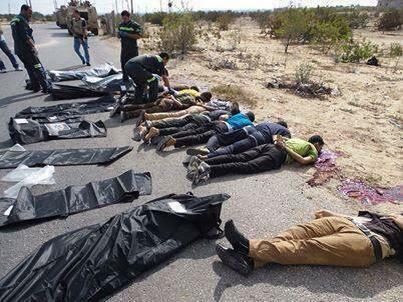 At least 24 Egyptian policemen were executed today by Islamist militants in the Sinai Peninsula. The attack, one of dozens in the Sinai since the ouster of former president Mohammed Morsi in early July, comes amid an ongoing crackdown on the Muslim Brotherhood. According to press reports, the policemen were ambushed while they were traveling to their barracks near Rafah. It remains unclear how exactly they were killed. Unidentified sources told Reuters that the militants attacked with machinegun fire and rocket-propelled grenades. The Associated Press was told, however, that the soldiers were killed “execution-style.” “The militants forced the two vehicles to stop, ordered the policemen out and forced them to lie on the ground before they shot them to death,” AP reported. According to Daily News Egypt, the militants fled into the Sinai with the buses after killing the policemen. No group has yet taken responsibility for the attack. The Popular Resistance Committees, a Gaza-based group, said that Israel was responsible for the attack, Ma’an News Agency reported. Since the start of the most recent crackdown on the Muslim Brotherhood last week, which has left at least 850 people dead, many extremists have called for “jihad” in Egypt against the army. Since the ouster of Mohammed Morsi on July 3, there have been near-daily attacks in the Sinai Peninsula, which have left dozens dead. On Aug. 7, the Egyptian army claimed that it had killed 60 terrorists and arrested over 100 in the Sinai over the past month. Thus far no proof has been provided to support the army’s claims, however.